Home → Across America → Did Robert Wagner Murder Natalie Wood? 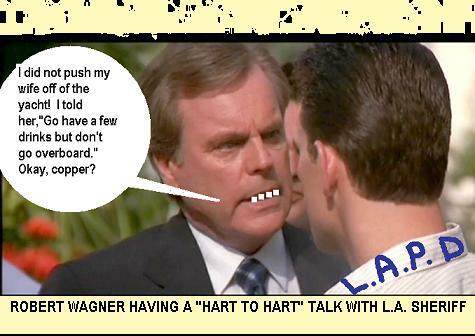 Veteran actor Robert Wagner might have to have a “Hart to Hart” talk with law enforcement, and if some “new evidence” is true, Wagner might be taking out a reverse mortgage on a jail cell. Dennis Davern, skipper of the Splendour, the yacht from which Natalie Wood fell into the Pacific ocean and drowned thirty years ago, told NBC’s “Today” show on Friday that he made mistakes by not telling the truth about events leading to the death and had urged Los Angeles County sheriff’s homicide investigators to reopen the case. Is Rober Wagner a killer? We might never know — but we don’t think so. We thing that he had something to do with Wood’s death in that he went to bed despite the fact that the two had been fighting and she was drunk — and so was he. According to the coroner at the time of Wood’s autopsy, her death was accidental. She fell from the boat while trying to get into the boat’s dinghy in the dark. She hit her face on the way down and the weight of the water that soaked her down jacket made it impossible for her to climb aboard the dinghy. Bruises on her body offer evidence that Wood, in an adrenaline fueled panic, fought to climb into the dinghy in very cold waters. William Holden died the same month after falling dead drunk against a marble fireplace mantel while Stephnie Powers called Robert Wagner about life insurance.